Some recipes hit the spot others do not. I am grateful that most of the time Chris and I are on the same page when we like or dislike something. We both started out liking this recipe, and then we did not. We used lime chips to dip and scoop the fundido. After a few minutes the cheese got really stringy and no longer was fun or possible to pick up with a chip. Maybe I am biased because we have had some amazing fundido dips at a few different restaurants here in Portland where the cheese stays soft and easy to dip with over the course of the meal. For this particular recipe I had to cut chunks and add to the chip in order to eat. Additionally, the chorizo left so much oil behind that it felt like quite a mess. Two things to note. We cut the recipe in half and still had way too much food and did not want to keep what was left over. The second thing — I am not giving up. 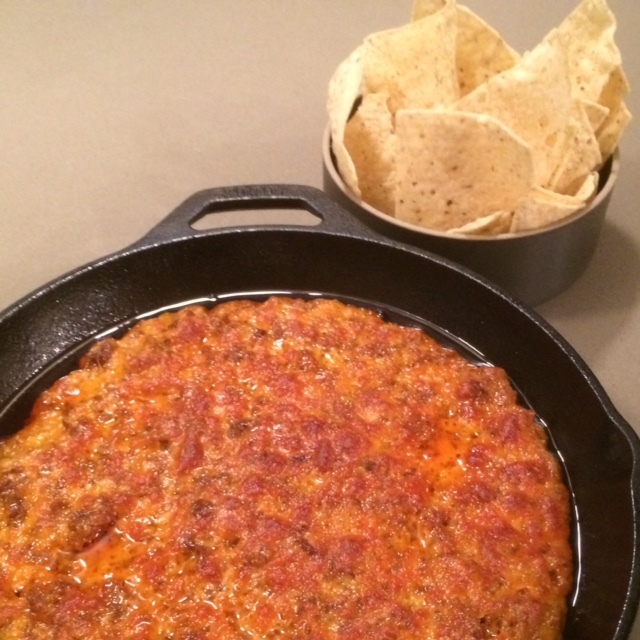 I want to find a fundido recipe that keeps the cheese softer, more fun to eat, and not feel like I have a tire around my waist after finishing dinner. You might try this recipe (I mean look how easy it is) and decide if you like it. If you do, let me know. Coat a 9-by-9-inch baking dish with the olive oil. Heat a large, deep-sided, nonstick skillet over medium-high for 1 minute. Add chorizo** and cook for 4 minutes, breaking any big chunks apart. Add Oaxaca cheese, and cook together for 3 minutes more. Remove cheese and chorizo mix to the baking dish. Turn broiler on high and cook for about 5 minutes, or until top of cheese is golden brown. *Note: We did not use Don Froyland brand. **Instead of chorizo, add 1/2 cup yellow onion and cook over medium heat for 2 minutes. Add either 2 lbs fresh mushrooms (chanterelle or shiitake, sautéed), or 10 poblano peppers (broiled, then steamed in a paper bag, peeled, deseeded, and diced), and cook another 3 minutes before adding the Oaxaca cheese.